That's a rare catch although I have a feeling we will be seeing more of these gars. Like the motoro ray or the peacock bass, these gars seems to be the latest introduction into our waters by hobbyists. I would like to add that to the fish species page but I do require a clean picture of it. 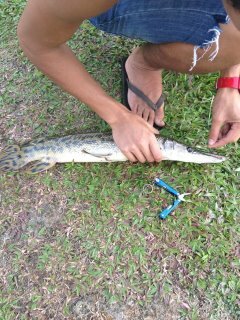 By the way, Im just interested in catching and releasing the fish. The experience is good.